I am not sure what all the fuss and bashing going on now on the internet about Narex Chisels. I see article after article that A) they don’t hold and edge, or B) they require a lot of prep, or C) they just are a cheaply made chisel. C: IN the grand scheme of things they are cheap, but not cheaply made. At roughly $13 a copy they are very affordable. Have good length, good balance, and I think they are pretty well made. B:) I have about 14 of these chisels in my shop and I found that they don’t take much prep work at all to get them to what I consider a working state. I’ve never spend more than 5 minutes flattening a back, (and that was on the 32 mm one, just over 1-1/4”. They come coated to protect them and a quick dip in lacquer thinner and a paper towel takes that right off. Or once I forgot and it came right off during the prep and sharpening. A:) The claim that they don’t hold and edge. I took all of mine to my local machine shop that had a rockwell tester,and NONE were under the claim of 59 Rc. Any where on the blade. Now 59Rc is just under metal cutting tool hardness. I remember turning tools being hardened to 62Rc or 63Rc. 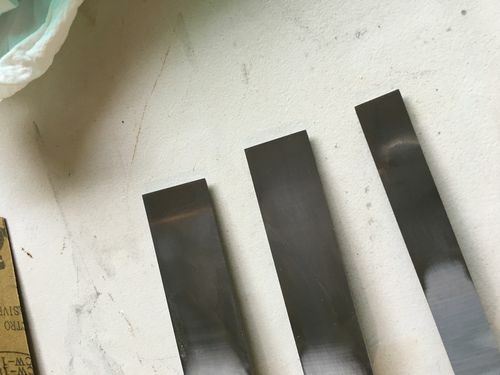 to cut ferrous metals. I suspect that the issue is in the sharpening technique. Either while grinding they heat it up and lose the temper on the edge or they test for sharp by touch, (I do too) but they fail to remove the sharp burr created in any sharpening process. and then the burr breaks off after a short amount of use and you’re left with a less than great edge. 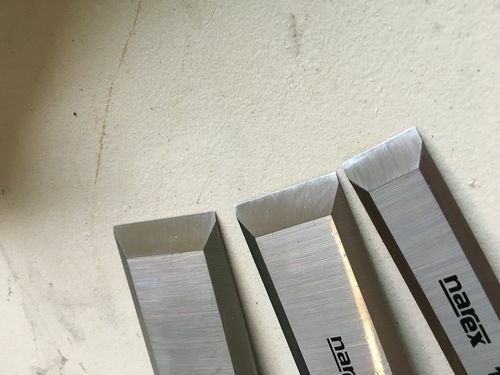 The three chisels pictured were sharpened about a week ago. Since then they have chopped dovetails in Red and White Oak, Hard Maple, Some Teak and purple heart. They held up just fine. Now it should be noted. My technique and it seems it’s the best for me, and it stood the test of time, is to keep your sharpening system at the bench and after every couple of corners of dovetails you draw it on there for 2-3 passes. It’s easier to keep and edge than create a new one. While some may say that is cheating, I think it’s good practice. So next time I will not do that for one chisel and I’ll let you know how it holds up. 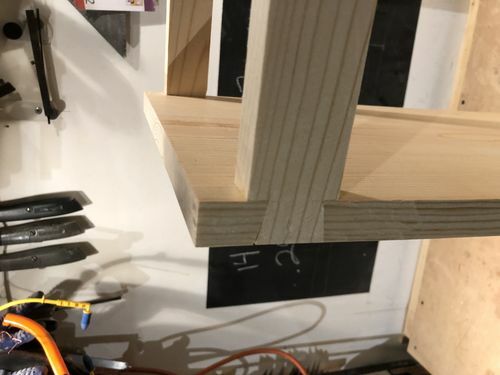 As I move down this path of more traditional woodworking I’m finding that it really becomes a lifelong technique learning path. I started by hand cutting joinery. 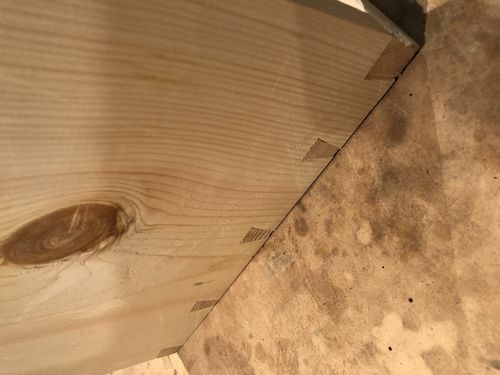 I’ve found when cutting dovetails that I cut tails first when making end to end joint when both pieces are exactly the same width, but tails first for other applications. So when I’m asked by woodworkers if I’m a pin guy or tail guy I say yes. I’d be curious what your thoughts are.